I'm in New Mexico on the Green Chile Cheeseburger Trail and I got a little sidetracked today. While there is indeed a green chile cheeseburger at Bob's Burgers (it's called the Ranchero Burger), I couldn't resist trying the tortilla burger (which also has green chiles, so it's like a burger except without the bun). Read my full review with more pictures after the jump. Bob's Burgers is a regional chain located mostly in Albuquerque, New Mexico. It's not the only place you can get a tortilla burger, but it's the first place where I found it. The tortilla burger is exactly what it sounds like: a green chile cheeseburger with a flour tortilla in place of a hamburger bun. 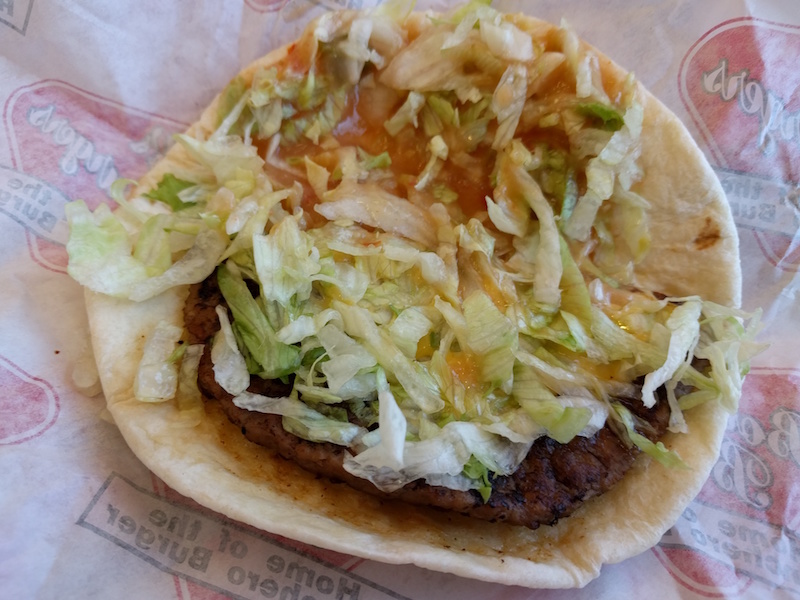 Right off, I noticed it's easier and less messy to eat than a burger. But also I think it might even taste better. 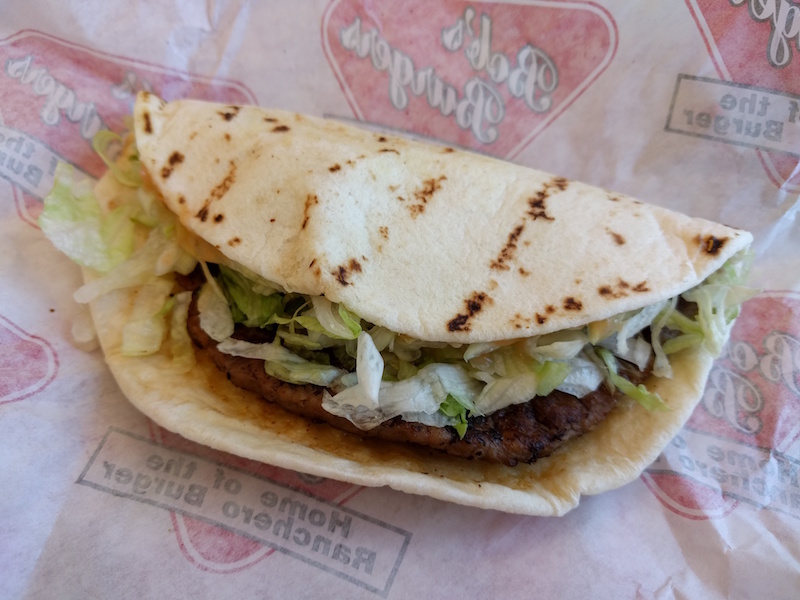 The flour tortilla adds just a little extra flavor and texture that you don't get with a hamburger bun. I really liked this a lot. By the way, the green chiles used at Bob's Burgers are hotter than what's found in a typical green chile cheeseburger. At most other places, the green chiles are mild and sweet. But the ones at Bob's Burgers are much hotter. So if you like a spicy burger, this is the one for you. Today was Friday and as it happened, the Frito pie is the day's special. 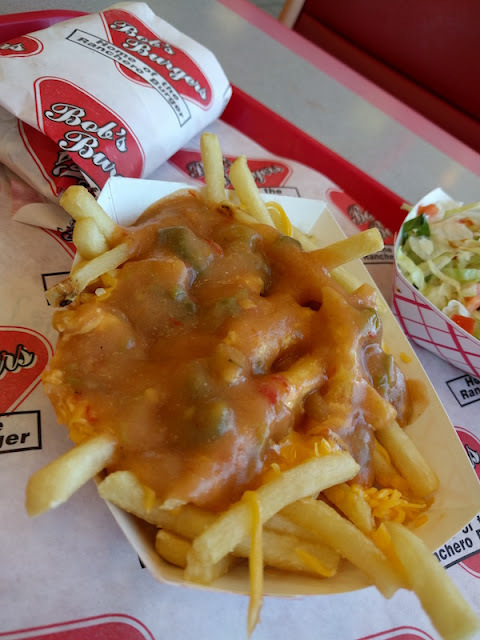 And according to Gil's New Mexico food blog, the one at Bob's Burgers is an award winner. 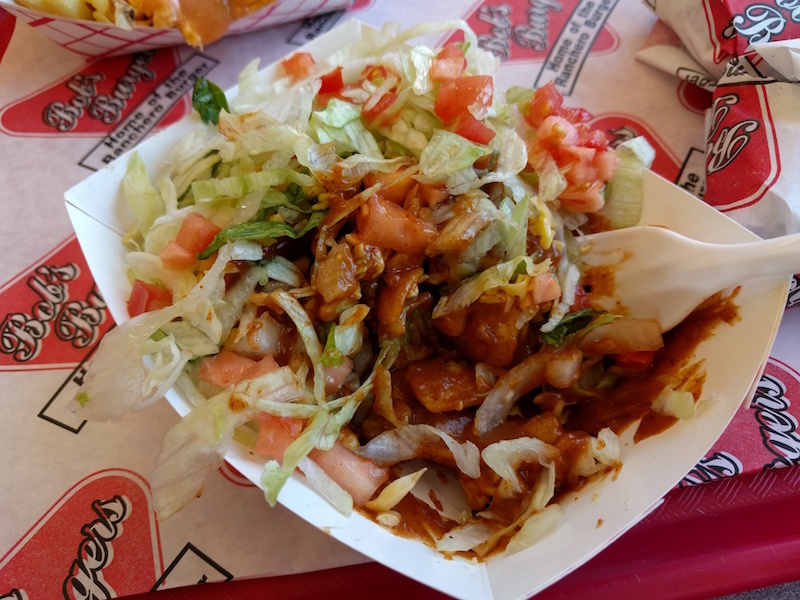 The Frito pie has some really tasty chili covered with Fritos chips, cheese, lettuce, tomatoes, and onions. Delicious! It's not served in a Fritos bag like it is at some other places, but I don't think all of this would have fit into a Fritos bag. 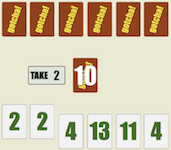 The combo comes with fries, which you can upgrade with either green or red chile sauce. I got the green chile sauce, and it was spicy like the tortilla burger. These also had a lot of cheese, and I was reminded of a spicy version of poutine. These were really good. Every item you took a picture of looks tasty. The regional twist of American classics of cheese fries and Frito pie is a treat I look forward to trying.